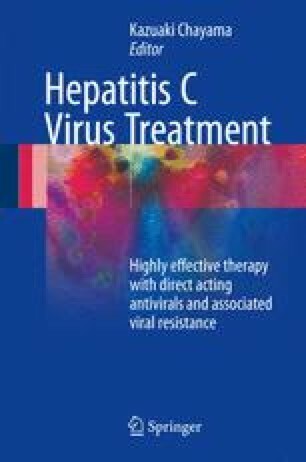 Due to the recent development of various novel small molecule compounds called direct-acting antiviral (DAA) agents and their dramatic antiviral potency against hepatitis C virus (HCV), more than 90 % of patients can now eradicate HCV with DAA therapy, a drastic improvement over the days of interferon therapy both in terms of efficacy and tolerability. On the other hand, the emergence of resistance-associated variants (RAVs) during DAA-based therapy has become a major problem. Namely, due to their high potency and specificity, there is a risk that patients treated with DAAs might develop resistance to one or more classes of DAA. Because of high cross-resistance among the small number of approved DAAs and the limited number of targets, it is also possible for HCV strains resistant to all current DAAs to emerge. Although it is possible to some extent to predict the emergence of RAVs through screening for the presence of RAVs prior to therapy using direct sequencing or other methods, precise and accurate prediction is still not possible because the presence of RAVs at baseline does not guarantee treatment failure nor does the lack of preexisting RAVs preclude the emergence of resistance through de novo mutation during treatment. In order to determine whether the emergence of RAVs is predictable based on the composition of HCV quasispecies prior to treatment, in this study deep sequencing was used to correlate the presence of RAVs at baseline with the emergence of RAVs during treatment in patients treated with interferon-based DAA triple therapy versus interferon-free DAA therapy.